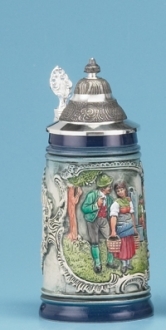 This unique, full-color German stein features a soldier on horseback bidding his farewells. The base of the stein flares out and the front reads "Prosit." This two liter stein is hand-painted and stands 15-1/2 inches high. An ornamental pewter lid completes the item.